Helping Australians make smart health choices. As there is an increasing desire amongst Australians to find health information online we have a duty of care to ensure that the information people are accessing is safe, relevant and trustworthy and appropriate to the Australian context and service standards. Not all GPs are able to be online providing advice to patients through websites or social media and this is why healthdirect provides your patients with qualified health information to help them make informed choices about their health concerns. The healthdirect app combines three trusted tools to help Australians make health decisions safely, quickly and easily. Users can check their symptoms, search for trusted health information, and find a health service at the touch of a button. There is no other Australian app that offers this unique combination of tools. Guides people through a set of questions to help them better understand their symptoms and receive personalised advice on what to do next, whether its self-care, see a GP or visit another health service. Read more information about the Symptom Checker. At those times when your patients can’t see you, they can access the National Health Services Directory to find the closest health service that meets their needs and directions to reach it. 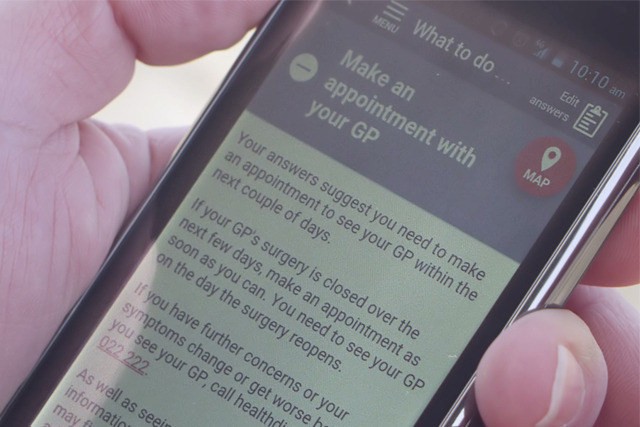 Patients can access details about local health services such as opening hours, availability in the after hours period and bulkbilling options. Instant access to information on thousands of health information topics sourced from Australia’s leading health organisations. We encourage you to promote healthdirect to your patients and colleagues, and invite you to give us feedback so we can continually improve our service. Being in the National Health Services Directory means other health professionals as well as patients can also easily find you so make sure your details are up to date in the National Health Services Directory. Download it now. 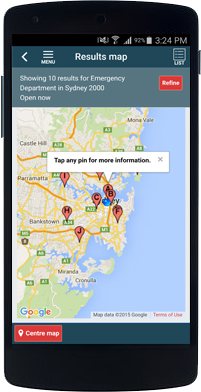 Search for 'healthdirect' in your app store.